Helles yeah – It’s about time! 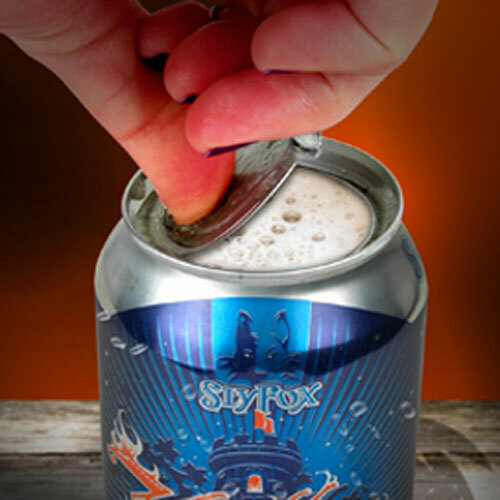 Pottstown, Pennsylvania’s Sly Fox Brewing Company has just announced it will be releasing it’s new Helles Golden Lager in a new kind of beer can – one with a completely removable top. “This technology allows the full flavor and aroma of the beer to hit the drinker’s senses and makes the can an even more appealing package for outdoor activities and situations where you want to be able to move around and sip your beer easily,” said Sly Fox Brewing Company head brewer Brian O’Reilly in comments distributed via the brewery’s website. Sly Fox is introducing the new can with the early April release of Helles Golden Lager, and plans to do a limited release of their Pikeland Pils for Phillies fans who venture out to Citizens Bank Park come summertime. I’m interested to see how this new open-top container will go over with consumers. When Sam Adams was researching designs for their new can, a removable top was an approach favored by brewery founder Jim Koch, but it freaked people out in the test groups, as they imagined all sorts of flying pests and other outdoor detritus having easy access to their exposed lager. I prefer what Sly Fox has done, but others may find it off-putting. Also no word on if the tops can be used as throwing stars or if they’ll easily open a toe, but as a person who’s old enough to remember finding beer can pull tabs in the sand, I’m hoping the safety of the lid’s edge has been considered in the design. At any rate, I need Oskar Blues to take note here – we need to see this technology on Dale’s, Old Chub and MLYP by June. Get on it, folks! What do you think, cool, creepy dangerous or dumb? As always, let us know below! ← Hey, Its Friday! What Are You Drinkin’ This Weekend? So I guess this means I won’t have to dust off the faded neon yellow Discovery Museum plastic cup that’s been my constant companion to the kid’s summer camp pool for the past couple years. Bravo. Just seems to make too much sense not to do it. And about the shrinking wallflowers who were worried about incoming insectiles, correct me if I’m wrong but I’m pretty sure the same risks have always been presented by the ubiquitous Red Solo Cup (pre and post country music fame). I’m with you on hoping for more widespread adoption by other can-enabled brewers. Avery White Rascal and, dare I say it, Alchemist Heady Topper???? Ha ha – you’ll never see Heady Topper in one of these. John Kimmich was quite clear that air and light are the enemy of his beer – that’s why he wants you to drink it from the can, where a disk of carbon dioxide sits on top of his precious liquid and protects it from the ravages of oxygen. Taking the top off would make him crazy! For the craft beer drinker, I think its a step up–you get the lightness and convenience of the can (and its light-denying properties) as well as the olfactory pleasure associated w/ drinking good beer out of a glass or stein. So you’re saying bad for idiots, good for beer geeks. I see kids slicing off their fingers. Well, drunk kids. Yeah, me too. I’m pitching this story to the folks over at Today, and if it’s a go, I’m going to dig deeper into the safety issue. I’m assuming that it’s idiot (kids – and Don) proof, but it’s all fun and games until Junior loses a pinky. I see these new cans turned into dangerous fleshlights. Most disturbing comment on beer and whiskey bros. nice job John! Yup, it’ll take a little personal responsibility to make sure that doesn’t happen, and many people are too selfish to give a damn. I think this would be less of a problem w/ craft beer drinkers. However if Big Beer adopts the style, then yes they will become part of the trash load–along w/ soda cans, whiskey bottles, cigarette packs, fast-food packaging, etc. I think it’s a great idea, but like everyone else, I do see the lowest rungs on the ladder injuring themselves in some form or manner. I wouldn’t hold my breath on Oskar Blues, Avery, etc. getting anything like this anytime soon. Most Colorado breweries get their cans from Ball here in CO, and I’m sure Crown, who’s making Sly Fox’s cans will have patented the process. That’s not saying Ball can’t come up with something similar, just not the Whole Monty. I dunno know about that. Sam Adams was working with Ball on their cans, and they had the open top concept as well, so Ball has the technology. They just need a partner who wants it. I’m going to dig deeper into this for my Today.com column next week and see about the hazards and benefits – I’m curious to see how far it has been thought through. It’s interesting that Sam Adams heard concerns about the top being too open, when a solo cup and keg has never caused any problems before. Yup. I’ve actually sent some questions over to Jim Koch at Samuel Adams to get his input on the fact that Sly Fox brought this can to market when he decided against it. Hopefully he’ll provide some insights – I know they went through a huge process to wind up where they did. I like to think Tallgrass Brewing out of Manhattan, KS was onto something early. They deal cans mostly exclusively now, I believe, and they have some really sweet can designs. I always use Oskar Blues as my point of reference for craft can pioneers – they were canning their stuff way back when, before anyone else thought it was a wise thing to do. Their solution to canned beer is simple and elegant, just the way I like things. But for some reason, pull top beer cans are the whipping boys for environmental protagonists, and a litmus test to demonstrate just how low we’ve collectively sunk as a species, when people hurt themselves with this convenience. No problems with digital amputations, tongue lacerations, or roadside litter if the pull top was from the old (metal) Pringles cans, nut or soup cans. But fill those same containers with beer and it will spontaneously generate legal actions, new laws, and a new subset of stupid behaviors to occupy the human pantheon. I like what Sly Fox has innovated and predict many injury free sips in my future. But then I was raised when water pipes were made of lead, eye protection was squinting, and cars had metal dashboards and no seatbelts in the back. In other words, I survived. Now pipe has to be copper, eye protection comes with a head strap, and cars have padded everything, airbags, ABS, and safety glass, which apparently have preserved the lives of those, who most likely will hurt themselves with a pull top beer can, then sue. Few soup sippers or Pringle munchers (which is now my favorite new insult) wind up drunk and careless after opening their respective vessels. I think folks generally don’t like people who drink beer in public, especially ones who don’t give hoot and choose to pollute. in their foxy fox sox.